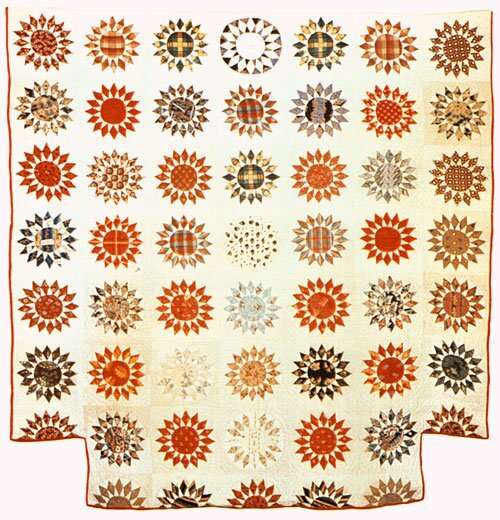 A wonderful array of fabrics so typical of the time period make up this charming pre-civil war quilt, measuring 73" x 74". The sunburst pattern is timeless and offers an opportunity to utilize all your favorite scraps. View closeups of the Signature Block and some of the lovely fabrics in the " Fabric Fashion Show." A foundation pattern along with hand piecing instructions gives you the choice of quick-piecing or using hand work to complete this classic. A cross stitch pattern to replicate the Signature Block and quilting stencils reproduced directly from the quilt complete the package. Acrylic templates for the S.S. Larkin Quilt are also available!